Our 110 acre sanctuary is one of the largest privately-owned properties on the Chesapeake Bay. It is a peninsula with the Chesapeake Bay to our east and our lakes to the north and south. It features an incredible 1000 feet of private Bay-front beach and over 3000 feet of pristine inner-coastal shoreline - overall, boasting nearly a mile of private, water-front property! Here, nature is your only neighbor. White sandy beaches, a cozy lagoon, a giant sand dune, and an immense forest provide the perfect habitat for all kinds of wildlife - and lots of family fun. Swim, kayak, hike, bike, fish, catch crabs - explore nature at its best - all on our property! Enjoy a deluxe kids' play set, basketball, volleyball, horseshoes, and many more outdoor and indoor games too. Spread out in our stunning and spacious 4100 sq. ft. home. Designed by renowned architect, Jim Glave, it enhances your experience with an open floor plan and panoramic views of the Bay. A large screened porch directly off of the kitchen is perfect for dining, entertaining, and relaxing. A rooftop deck provides dramatic and unique views. 5 bedrooms and 3 full baths accommodate up to 14 people. The first floor master suite is extraordinary with a central sky dome, sitting nooks, built-ins, and a lavish bathroom with a separate vanity, two sinks, walk-in shower, and Jacuzzi tub. Explore our community. Historic Reedville, once considered one of the wealthiest towns in America, has 19th century mansions that will astound you. A fisherman's museum, antique shops, fine restaurants, wineries, and challenging golf courses are also popular attractions. Come for the peace and privacy. Leave with a better perspective. The Preserve is the perfect Chesapeake Bay experience! Note: We own 2 other rental properties on the Bay (VRBO#399839 and #644192). We've rented for 6 years and had many satisfied guests and positive reviews. Professionals during the week and total opposites on weekends! We are Northern Virginia natives who cherish convenient getaways to water and woods. We found it on the Chesapeake Bay. The easy commute to a nature-lovers dream located in a folksy, family-oriented community is all we could ask for. The tranquil setting and spectacular views are why we chose this property. We've owned another nearby Bay-front home for six years and continue to enjoy it immensely (VRBO#399839). But this property is different and unique in many ways. We look forward to enjoying and sharing both properties for many years to come. Peace, privacy, and stunning views - all thanks to nature! 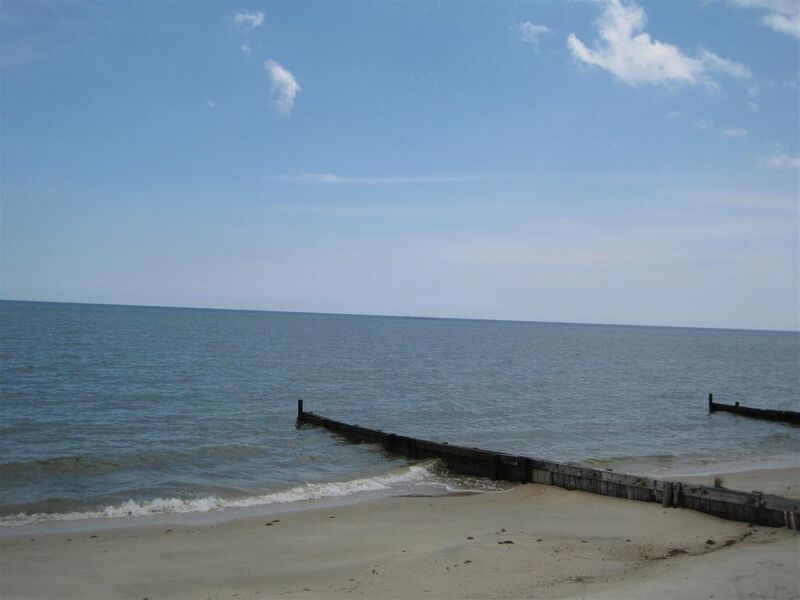 1000 feet of private sandy beach directly on the Chesapeake Bay. Shallow, calm water is ideal for children. Additional 3000 feet of private lakefront shoreline. Technically, we are Bayfront. But positioned at the widest part of the Chesapeake, with a 30-mile view, it appears you're looking out across the ocean. Extra-large and unique farmhouse table, bench and chairs seat 10. Additional dining on screened porch and outdoor patio. Beautifully maintained Bay-side lawn and acres of wilderness behind you. Cozy water-front fire pit with adirondak chairs perfect for enjoying s'mores, songs, stories, and stars. Balconies off of every bedroom! Large screened porch directly off of kitchen and living room. Outdoor cooking/sitting patio. 2nd screened porch on top floor. Lots of fun gear/toys to use. Personal floatation vests for all ages too. Bring your boat! There's a public boat launch a few minutes from our house. The photos do not do justice to this property. There is water on 3 sides, and many acres of land to roam. The property is peaceful and very private. The house is spacious and clean. The bay was calm most days, but when it wasn't, we took the kayaks and canoe out on the 70 acre "pond" and explored. There is an abundance of wildlife - my kids were amazed to see the pelicans, herons and bald eagles gliding by. It is a really unique opportunity to experience the Chesapeake Bay! Ultimate Chesapeake Bay Experience - so true! This is truly a one-of-a-kind property. It is an amazing opportunity to be on so much land, right on the bay. There is water on 3 sides, with the back of the house facing the wide-open Bay. It is like being at the ocean, but more peaceful. The tall pines gave plenty of shade to the yard, while the long sand beach is fully in the sun. We spent hours kayaking, hunting for sea glass and other treasures, exploring the woods, and bird watching. The house is spacious, and has everything you need for a large group. The kitchen is well-stocked, and large; great for a group like ours that loves to cook. To be able to experience nature like this was truly amazing! We love this property.... we will want to rent it again in the future~!!! We were really blown away when we arrived at this property. As you drive down the long, private tree-lined driveway, the beautiful house comes into view, and then the bay. At this location, the Bay is about 30 miles across, so you feel more like you are at the ocean. But, for us , it is better than the ocean, because the water is more tranquil (most of the time!) and there is a long, gentle slope of shallow water - perfect for the kids who spent the days on the large sandy beach- swimming, kayaking, and treasure hunting. The adults enjoyed the beach too, but also appreciated the open kitchen, spacious screened porch, 2nd floor deck, and living room. There was plenty of room for all. The house is charmingly decorated, and the kitchen is well-supplied. We also enjoyed exploring Reedville- dinner at Tommy's, visiting the Fisherman's Museum, and ice cream at Chitterchats are a must. The owner Bill was amazingly helpful during the reservation process and during our stay. The piece of land has water on 3 sides, and is completely tranquil and private. When the wind off the bay was a bit much one day, we spent hours on the sand bar on the 70 acre sheltered "pond" that is open to the bay on the south side of the house. It is remarkable to be able to rent such a unique and wonderful property- we will be back! This was our fifth year at The Preserve – and I think our ninth stay – and we had a fabulous time yet again. We had a more extended stay this year and experienced glassy surf, roiling and crashing waves during and following a storm, and then again the nearly still water – ideal for teaching the kids how to kayak. The property is remote and distant from neighbors, and our grandkids had great freedom to explore. We hit the water twice a day. The kayaks got a lot of use once the surf settled down. The big storms were kind of exhilarating, and the churning waves that followed were great fun. We brought a volleyball set and a couple of our own bikes, and one grandson learned how to ride – a triumph! The local crabs were exquisite. The view from the great room in the house cannot be beat -- you can get lost in it. Our three-generation family always thoroughly enjoys our vacation here, and yours will, too! Many thanks to Bill for always being readily available. You're the best! Fantastic experience for all ages! The house is amazing and offers so much room for families! The wall to wall windows offer an unbelievable view of the bay, inlets and the close by lake. Our family enjoyed beach time and the huge expanse of lawn shaded by the large pine trees. We had some small children and infants with us -so getting out of the sun was wonderful when they needed a break. The kids loved playing in the surf and looking for minnows and crabs. The canoe and kayaks were also very popular as they were used to move through the inlet to look for good fishing spots or to just take a ride. The house offers so many areas for families to get together or find some time alone to read. The bedrooms were beautiful and very comfortable. My granddaughter was the first one up every morning and she would watch the sunrise with her Mother and Grandpa down by the water- those memories are priceless. I think by far our favorite areas were the fire pit where we cooked and made s'mores and the bluff overlooking the bay where we sat every night to reminisce about the day or just enjoy the beautiful view. We named the nearby inlet and its sandbar -Pirate Island, because my grandson was convinced that there was treasure buried there. It was another favorite place to explore for wildlife and sea shells. This house is truly amazing and we are looking forward to coming back next year to make more incredible memories. Fish (private fresh water and salt water lakes directly to our north and south), hike and bike our vast grounds and charming neighborhood, play golf at 4 local courses (including King Carter, Golf Digest's 2006 public course of the year), take nearby ferries to Smith and Tangier Island, explore Northern Neck history - Home to a number of presidents and famous Americans, enjoy quaint and historic Reedville, visit local antique shops and wineries.